On last night’s DANCING WITH THE STARS the couples worked hard to impress the judges. We are down to the last eight contestants and the stakes are getting higher and the competition tougher. Last night the eight remaining couples hit the dance floor and paid tribute to singer, songwriter and legend Stevie Wonder. After last night’s performances at the top of the leaderboard is Kellie Pickler and professional dancer Derek Hough and at the bottom of the leaderboard is Victor Ortiz and professional dancer Lindsay Arnold. Did you watch last night’s show? We did and we recapped it here for you. On last night’s show Stevie Wonder took over the ballroom as “Dancing with the Stars” devoted, for the first time, an entire evening to one artist. He performed some of his classic songs, including “Sir Duke” and “My Cherie Amour,” and the celebrities will dance to his greatest hits, including “I Just Called to Say I Love You,” “For Once in My Life” and “Signed, Sealed, Delivered (I’m Yours).” Also last night we got to see the first group dances of the season, Team Paso and Team Samba performed either a Paso Doble or a Samba. Logic dictates that one of the couples with the lowest scores – Victor Ortiz and professional dancer Lindsay Arnold – will be leaving the competition, but although Victor was in the bottom, I don’t agree he is the worse dancer. The former Bachelor Sean Lowe is a horrible dancer, but the judges clearly want to keep him around another week and scored him higher that the rest of the dancers n the bottom of the pack. Len said this about his performance last night, “ It was riddled with mistakes. It was not terrible, but no great. I don’t get it why thought you had to take your shirt off.” After comments like that the judges still scored him a 21/30. No matter what the judges says, at the end of the day, the competition comes down to your vote at home. Who should leave? Vote in our trusty poll and let us know in the comments below which two couples you think should be going home tonight. 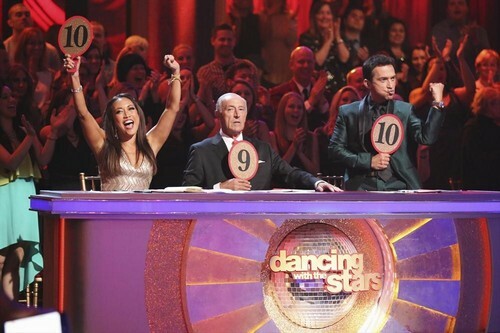 Who Got Voted Off Dancing With The Stars 2013 Tonight 4/16/13?